The Wimbledon qualifying draw encountered a series of shocks and surprises. It was a disastrous draw for the seeded players with none of the top ten players automatically qualifying for the main draw. Luca Vanni received a lucky loser spot in the main draw due to David Ferrer’s withdrawal. The highest seeded player to qualify was Dustin Brown, who was 12th. Despite the disappointing performance of the seeds, there are some qualifiers that have a good chance of causing a shock first round win. Titles – 4 Futures and 1 Challenger. Vincent Millot booked a place in his first Wimbledon main draw after an impressive qualifying competition. In the first round the Frenchman knocked out top seed Kimmer Coppejans. He then beat Marius Copil and Edouard Roger-Vasselin to book a place in the main draw. Since January Millot has reached the quarter-finals at two Challenger tournaments in Saint Brieuc and Tallahassee. In the first round, he will play Vasek Pospisil. Alejandro Falla edged out Germany’s Andres Beck in four extremely close sets to book his place in his third Wimbledon main draw. Falla recently reached the second round at the Gerry Webber Open as a qualifier. During the tournament the Colombian beat Janko Tipsarevic and Lukas Lacko. He also took a set of Jerzy Janowicz before losing to him. He has reached one ATP quarterfinal in 2015 which at the start of the year in Auckland, New Zealand. In the first round he will play Robin Haase. Falla has beaten Haase once before on grass which was in the second round of last years Gerry Webber Open in Halle, Germany. 19-year-old Elias Ymer has a 100% winning record in qualifying draws for Grand Slams in 2015. Following his victory over third seed Guido Pella, he became the first player since Julian Reister (2013) to qualify for the first three Grand Slam main draws in the same year. In the main draw he will play Ivo Karlovic. The Swede currently has a main draw win-loss of 11-12 in 2015. 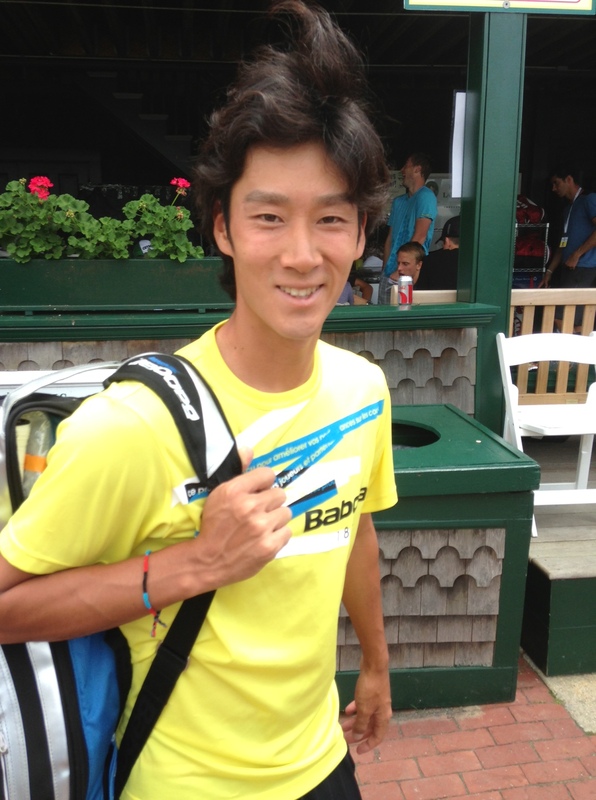 Hiroki Moriya’s recent run of disappointing results finally ended with him qualifying for the main draw at Wimbledon. Going into the tournament, the Japanese player exit in the first round in five out of last six tournaments. During the qualifying tournament, Moriya beat fourth seed and countryman Tatsuma Ito before producing a straight sets win over Matteo Donati. The best result of 2015 for the 24-year-old was reaching the semi final of the Batman Challenger in April. Awaiting Moriya in the main draw will be 9th seed Marin Cilic. Double junior Grand Slam champion Luke Saville booked his place in the main draw after recovering from two sets down to beat Luca Vanni. In the lead up to Wimbledon, Saville reached the final of the Surbiton Challenger where he lost in straight sets to Sam Groth. The 2011 Wimbledon boys champion will play Richard Gasquet in the first round. Igor Sijsling will play in his 9th consecutive Grand Slam following an epic five sets win over Paul-Henri Mathieu in the final round of qualifying. Since making the quarter-final of the Zagreb Open in February, the Dutch player has endured a series of early tournament losses which has contributed towards he decline to 170th in the world. In round one he will face Sam Querrey. Sijsling has played the American twice in 2012. He lost to him on both occasions. Titles – 6 Futures and 2 Challenger. Pierre-Hugues Herbert overcame Íñigo Cervantes in five sets in the final round of Wimbledon qualifying. The Frenchman won the Wimbledon Boys doubles title back in 2009 with Kevin Krawietz. He also achieved success in doubles on the pro circuit by reaching the final of the Australian Open earlier this year. More recently, Herbert reached back-to-back doubles finals in S-Hertogenbosch and Queen’s. He won the Queen’s title partnering Nicolas Mahut. He will play 19-year-old South Korean sensation Chung Hyeon in round one. Yuichi Sugita ended British hopes by beating Dan Evans to make the main draw. This is the second Grand Slam main draw appearance in his career after Wimbledon last year. Sugita’s best result in 2015 was runner-up at the ATP Saint Brieuc Challenger in April. He was edged out in the final by Nicolas Mahut. Awaiting the Japanese player in the main draw is world number 111 Blaž Kavčič. 2010 Wimbledon Boys champion Nikoloz Basilashvili enjoyed a comfortable journey into the Wimbledon main draw. After producing straight sets wins in the first two rounds, he beat Marton Fucsovics in four sets (6-4, 6-4, 3-6, 6-2). The Georgian has claimed one title this year which was at the ATP Raanana Challenger in Israel. He will play Argentina’s Facundo Bagnis in the main draw. 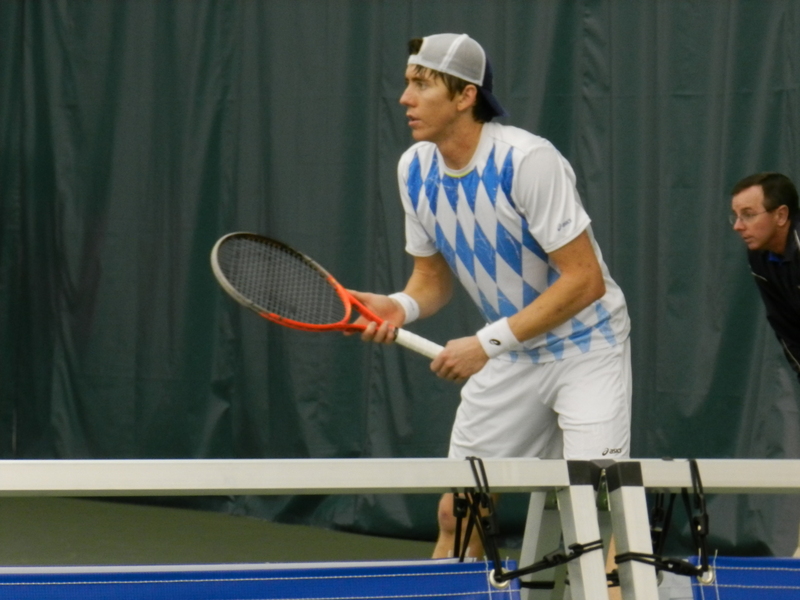 John-Patrick Smith knocked out 18th seed Bjorn Fratangelo in the second round to reach the main draw. In the final round, he beat Czech Republic’s Jan Mertl in straight sets. 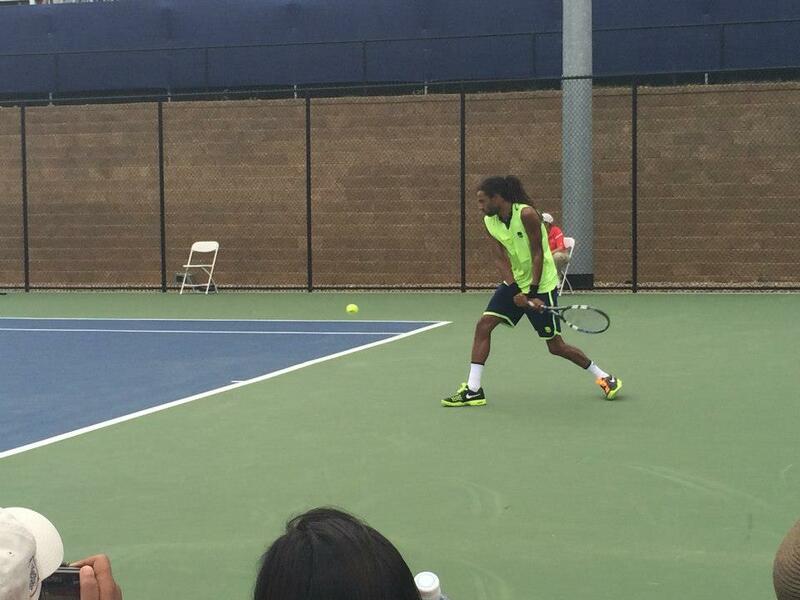 Smith won his third Challenger title earlier this year in Drummondville, Canada. More recently he reached the quarter-finals of the Surbiton Challenger in Great Britain. He will play another qualifier, Kenny de Schepper, in the first round. Titles – 1 Future and 10 Challenger. Veteran German player Michael Berrer endured a grilling five set match against 11th seed Adrián Menéndez-Maceiras before booking his place in the main draw. Berrer started 2015 in incredible fashion by beating Rafael Nadal at the Qatar Open. The German however, hasn’t been able to capitalize on the stunning upset with a series of unspectacular results on the tour. Except Qatar, his best performance was a semifinal appearance at a Challenger event in Israel in June. Berrer has played at SW19 five times before this year, losing in the first round of four of them. In his sixth Wimbledon first round main draw, he will play Adrian Mannarino. Dustin Brown didn’t drop a set on his way to qualifying for his fifth Wimbledon main draw. In the final round, he beat Italy’s Andrea Arbaboldi 7-6 (1), 6-3,6-4. Prior to Wimbledon, the German participated in back-to-back grass-court tournaments in Stuttgart and Halle. Brown’s best performance on the tour this year was reaching the quarter-finals in Doha at the start of the year. More recently he reached the quarter-final at a Challenger tournament in Rome last month. He will face Lu Yen-Hsun. Titles – 6 Futures and 3 Challengers. Kazakhstan’s Aleksandr Nedovyesov dismissed Belgium’s Yannick Mertens in three sets in the final round of qualifying. The Ukrainian born player has enjoyed success on the doubles tour in 2015 by winning two Challenger titles. In the singles he has recently reached the last four at the ATP Prague Challenger. He will play Serbian 22nd seed Viktor Troicki in the main draw. Clay-court specialist Horacio Zeballos upset 14th seed Ivan Dodig to reach the main draw of Wimbledon. The Argentine is yet to make a final in 2015 but he has reached the semi-finals of Challenger tournaments in Moscow, Russia and Leon, Mexico. This will be the thirteenth time he will participate in a Grand Slam main draw. He will play David Goffin in round one, a player who he beat in Miami last year. 15th seed John Millman beat a trio of unseeded player to reach the main draw. In the final round Millman overcame a slow start to edge out France’s Enzo Couacaud 1-6, 6-3, 6-3, 6-2. The Australian has been runner-up in two Challenger tournaments this year (Vicenza, Italy and Kyoto, Japan). He will play 16th seed Tommy Robredo. Titles – 2 Futures and 4 Challengers. Finally, Kenny de Schepper overcame tough resistance from countryman Stéphane Robert to set up a main draw showdown against another qualifier, John-Patrick Smith. The Frenchman achieved his best Grand Slam performance at Wimbledon by making the 4th round of the 2013 tournament. Since the start of the year, Schepper has only won seven main draw matches. The first ATP grass tournament takes place in Stuttgart and begins at the first June weekend just like the ATP tournament in ‘s-Hertogenbosch. First of all, welcome to Stuttgart! The city of the eternally lasting building lots, cranes form the skyline here and political demonstrations fill the streets. Far away from the noise of the city, the whole tennis complex Weißenhof is behind small forests on a mountain. 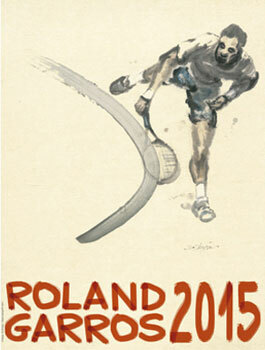 ATP Stuttgart’s tennis tournament, after its official sponsor called Mercedes Cup, was held for the first time in 1898. 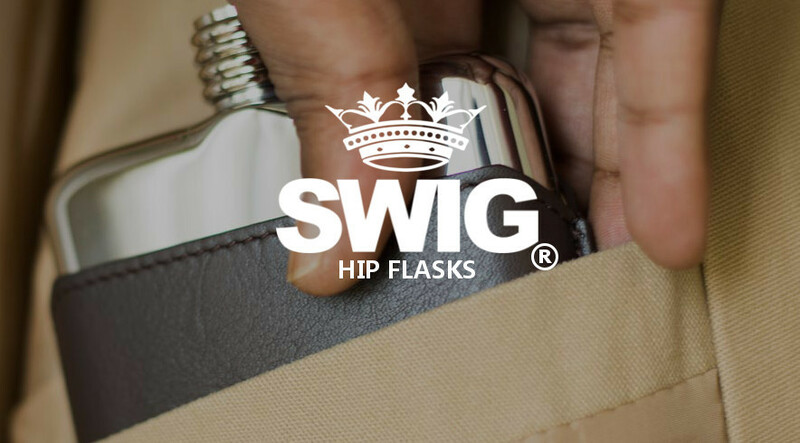 Hence it is very famous for its tradition and is popular among tennis professionals because of the friendly atmosphere and the good organization. Though the surface was traditionally clay, this year they changed it to grass as another preparation tournament for Wimbledon to have a more stellar field. It worked, as Cilic, Monfils, and Rafa Nadal are confirmed to play. It was a very hot day, the hottest after quite a while here in Germany, so fitness and stamina were very important. However, a lot of matches demonstrated many players, even ball kids couldn’t handle the heat. Robin Kern for example, who was 0-6 and 0-4 down, gave up and could barely move due to a minor injury, sending Jan Choinski into the second round. A lot of matches were played between Germans at the first qualifying round, one of them was the opening match between Peter Gojowczyk and Andreas Beck. Both players have good resumes and it should have been a good match, but unfortunately it wasn’t. Gojowczyk was dominant in the points and his serve was strong. Beck created just one break point chance, while Gojowczyk broke him twice and he could have broken him even more than that. However, these two breaks decided the whole match. Beck struggled with many service games, in contrast to Gojowczyk. 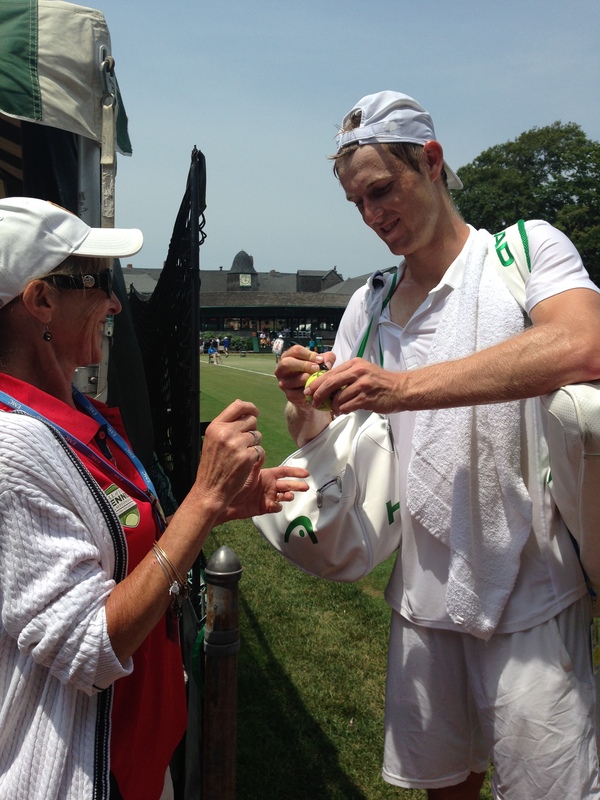 So Gojowczyk won the match deservedly 7-5, 6-4 and he remains a favorite to reach the main draw. Dustin Brown played right after Gojowczyk likewise on the Mercedes Court, the second biggest court here, and didn’t have any problem against Sebastian Sachs. The young German is outside of the top 2000 currently and hadn’t any chance to threaten Brown’s next victory on his beloved grass (6-2, 6-1). Germany’s new Davis Cup member Brown didn’t display his best tennis, though his groundstrokes were constantly good and he hit some great winners. His serve-and-volley was very sharp today and he has very good chances to get one of the qualifiers spot apart from some inattentive unforced errors. Way more hairsbreadth was Filip Krajinovic’s victory. As today’s top-match between the first seed and an in-form Daniel Brands featured highlights as expected. Brands won the first tiebreaker in clutch fashion, though he served for the set at 5-4 and wasn’t clutch there. He was more often at the net and hit some great volleys, while Krajinovic was too passive at the deciding moments and stood on the baseline. Both played very well in the second set, too. Service games were held with ease, just Brands had a few problems with his last service game in this set. Both played some great Serve-and-Volleys and both hit many aces. A typical good grass-tennis match, details decided the second set’s tiebreak. Brands destroyed his hopes of winning the set with a Double fault at 5-5 and Krajinovic could win his first set with a cross forehand winner after his opponent’s short shot. The tension rose from there, Brands broke Krajinovic’s serve after a very long and intense rally with a beautiful forehand-volley right to the baseline’s corner, just to get re-broken because of so many forehand UEs. Brands was obviously very disappointed and couldn’t raise his level. Krajinovic broke Brands’ hard fought service game (four times deuce) and end the game with a service winner (6-7(3), 7-6(5), 7-5). Brands got very disappointed by this match he almost won and walked as fast as he could back to the players’ restaurant. Another one who has to be mentioned here is Matthias Bachinger who surprised me a lot with his tennis. He defeated Somdev Devvarman 6-2, 7-5. Bachinger was very dominant in the first set, not giving Devvarman many opportunities and especially his forehand troubled the Indian too much. Bachinger held his service games with ease after he lost his first one in the first set. However, Devvarman lost three times his serve in the first set and didn’t have any clue how to stop the German. Bachinger’s key was his fitness: He moved very well on the baseline, he could defend a lot of dangerous shots and could combine it with good volleys and even better serves. The second set featured longer rallies (a bit rare for grass) and Devvarman was at least on eye-level with the German. Though he lost his first service game, Devvarman could raise his level to break the Bavarian again. Devvarman played more offensively and was more often at the net with his superior volley game. Bachinger struggled with Devvarman getting better and better, had many problems to hold his last service, but managed to win it with some impressive passing shots. As everyone expected a tiebreaker, Devvarman suddenly lost the control of the game, had some mishits. 30 all, Devvarman served very well, hit a very good forehand down-the-line Bachinger barely reached, hit a forehand-volley to the other side, but the German reached the ball running very fast and won the match with an overwhelming backhand-dtl-passing shot, amazing. Facing the matchpoint Bachinger returned Devvarman’s second serve with a beautiful backhand down-the-line-winner to end the match. Michael Berrer defeated Frank Dancevic in a very close match 6-7 (7), 6-0, 7-6 (3). Dancevic hit many great shots and his forehand worked today quite well, his problem was the inconsistency. He explained his loss due to lack of grass matches, just started to train at the same day on grass and stated Berrer served too well. He’s right, especially in the second set Berrer served very well after a short rain delay during the second set and Dancevic made mistakes you normally don’t do if you know how to play on this surface. Still, the Canadian raised his level again, could compete on a high level and called Berrer out, but the hometown boy was too clutch especially in the tiebreaker and had even opportunities to close the match earlier. Mischa Zverev had to play against Tim Puetz and Sascha’s older brother managed to win the match after he lost the first set 4-6, 6-1, 6-4. Tim Puetz didn’t play very well in the first set, though Zverev couldn’t do better. Right after Tim lost his first serve in the second set (0-2), it began to rain and that helped Mischa. Zverev hit winners after intensive rallies (especially cross) and Serve-and-Volley worked in contrary to the first set, when he hit some unforced errors. “Grass courts are fine and well-prepared” he told me after the match and “the [weather-]conditions here were fair for us”. Talked about his next opponent, Grega Zemlja, he emphasized he really looks forward to it, as “it will be the first meeting and [I] never played him”. A self-confident Zverev could certainly beat Zemlja who won in two close sets against Farrukh Dustov 7-6 7-5. The last match I watched, that was moved to another court was between Nikoloz Basilashvili and Alejandro Falla. I only caught the third set in full, but it was already enough! A roller-coaster. The Colombian seemed to have everything under control in the match, but the Georgian discovered the power he has in his forehand and broke Falla’s service game while he served very poorly. In the third set it was a match on eye-level, some great net approaches and some fantastic winners; one of them was a very long and intensive rally, Falla played as a leftie with angles and Basilashvili couldn’t leave the backhand-side till the Colombian hit a beautiful down-the-line forehand winner after a too short bh-shot to the middle of the court. Everything was fine for Alejandro, but he suddenly lost his serve again at 4 all due to a poor backhand error. Those who stood behind his wife (just like I did), witnessed the meltdown the Falla-clan had. Thanks God they said, Basilashvili couldn’t hold the game, as he served for the match and Falla broke him to love after three genuine unforced errors and a double fault. Falla held his serve, Basilashvili had even game point when serving, but a fh dtl-ue, a double fault and a forehand into the net sealed his fate. Falla didn’t even earn his match point, but I have to say it was very windy and not easy to play. Problem was Basilashvili still tried to overpower the Colombian with his forehand; it often worked, but at the end didn’t. This match would be the classical definition of a choke. Falla’s wife didn’t care and vamosed her husband over and over, Falla’s coach was just relieved. Basilashvili told me after the match: “I didn’t play well today, made too much errors.” Having the impression he tries to say he did everything wrong he added: “My next step is London (Queen’s), hope it will be better”. 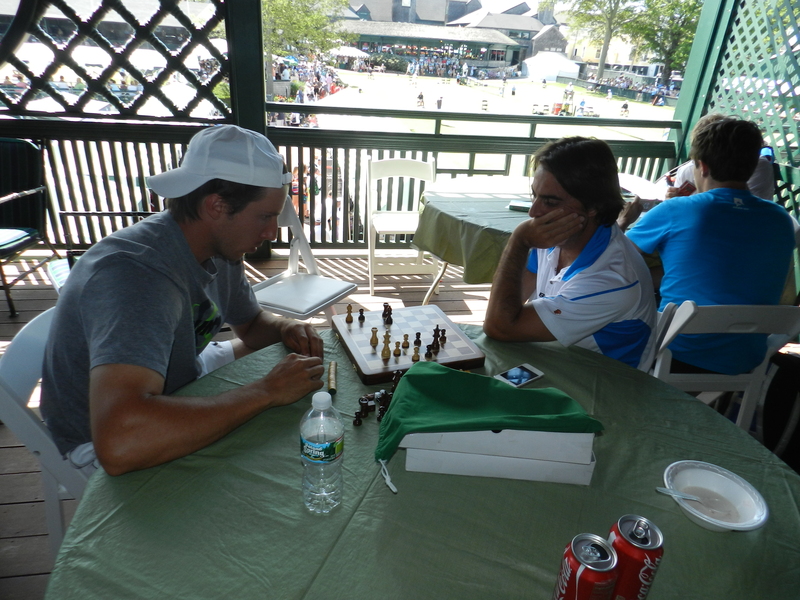 Hanging his head when he walked very slowly back to the players’ lounge, he ignored my positive comments on his play. I couldn’t fathom then why he was so disappointed, but being at home I just start to understand why and wish him the best. Match ended 6-4, 3-6, 7-5 for Falla. Remi Boutillier def. Aslan Karatsev 6-3, 6-4. Ilija Bozoljac def. Adrien Bossel 3-6, 6-1, 6-2. Dmitry Zhyrmont def. David Vega hernandez 7-6(1), 7-5. Yuichi Sugita def. Ante Pavic 7-5, 6-2. Mate Pavic def. Philipp Petzschner 6-2, 7-6 (6). Michal Przysiezny def. Vijay Prashanth 6-3, 6-2. Martin Fischer def. Jimmy Wang 6-2, 6-4. My last day at Roland Garros, an unbelievable experience for me. Started the day at Marco Cecchinato- Michael Berrer. The Italian was dictating every rally at the beginning of the match but as soon as he took the lead for 4-2 he had to face an improved Berrer. Cecchinato suddenly lost the plot and on 4-4 literally mentally checked-out and regrouped a bit only at 4-6 0-3. He kept shouting to his box “He is not missing a single ball”. I greatly enjoyed Gasparyan’s one handed backhand and Glatch’s classy tennis. I watched for a while Gastao Elias-Facundo Arguello. Elias was very nervous from 7-5 5-2, he started being less aggressive and Arguello sensed his opponent choking. They went to the tiebreak where Arguello played terrible tennis and at changeover over made a sign to his box miming “We can go home now”. He double faulted on mp. Arguello will not be going home however, as he reached the main draw as a lucky loser, and his reward is Andy Murray. Elias will face Benoit Paire. I moved to Luca Vanni-Andrey Golubev for their third set. Vanni was always the second best in rallies and had to save 0-30 on 0-0 and on 1-1 and also 15.40 on 3-3. He broke from nowhere Golubev on 4-3 and managed to hold without risks. He saved all the key points with his huge serve. At the end of the match as usual was very kind with everyone asking him an autograph or a selfie. Last ATP matches that I attended was Jared Donaldson-Nikoloz Basilashvili. It has been a great match, the best I watched in 4 days. Both played at great level and intensity, it is a pity that one of them could not qualify, both deserved. Donaldson lost 3 tough games from *2-1 to 2-4 in the third set and then he surrended. I had a tremendous time attending 2015 Roland Garros qualifying, and it was a pleasure to share my reports with the readers.